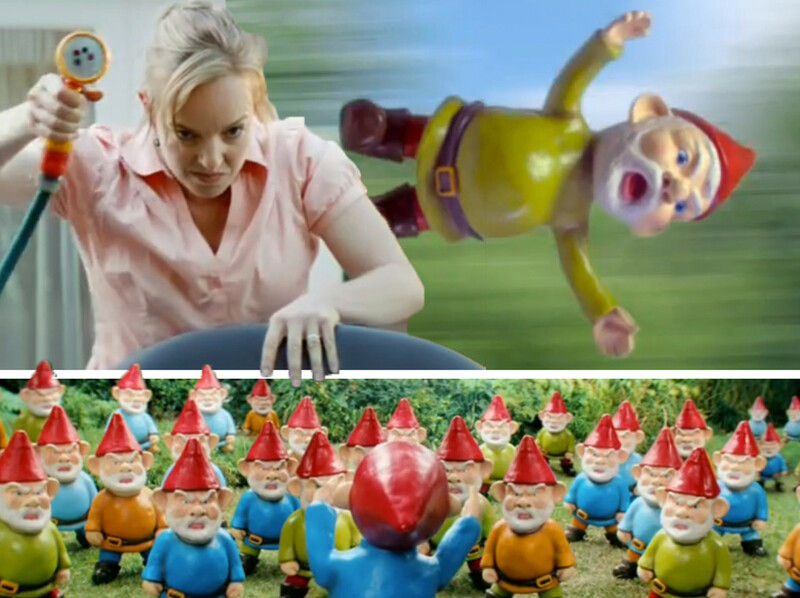 Perhaps you read a recent post of mine about boycotting IKEA for their horrendous anti-gnome commercial. Well, we’re not the only ones pissed off. 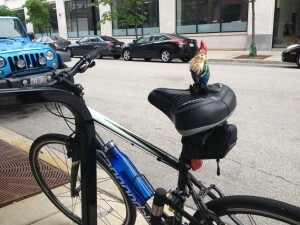 Clearly, you have NOT been reading this blog, Mr. Peter Wright! Outrage and debate is spreading throughout the world…and rightfully so. New Zealand’s seems to support us…thanks guys. However, Australia is teaming up AGAINST us! Try not to smash a human’s face in as you read this Ad News article who questions the legitimacy of us 50 complainers. Not that we’re biased or anything, but if you’re not with us, you’re against us. Have a couple beers to calm your nerves first and then give this commercial a view for yourself. The boycott of IKEA continues, but we’re not stopping there. Oh no, no, no. 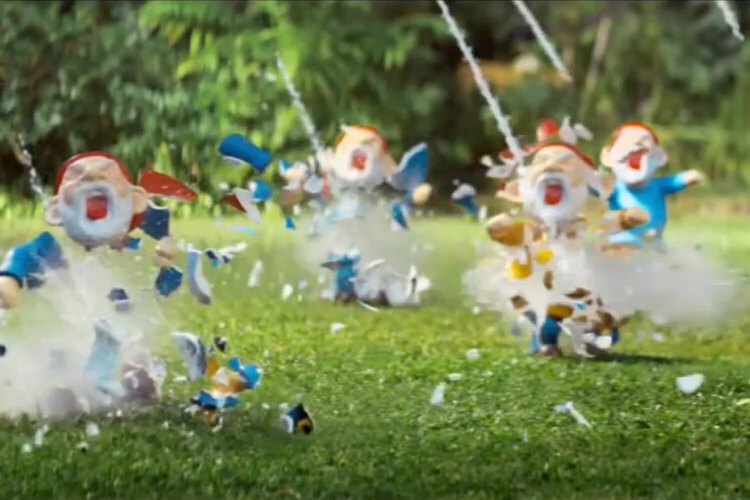 This violence against gnomes has gone TOO FAR! The Gnome Abode is seeking a military general to lead us in an epic battle of gnome-sized proportions. Gnomes hold down a lot of careers over here, but we’re severely lacking in military support. Now is the time to protect ourselves. 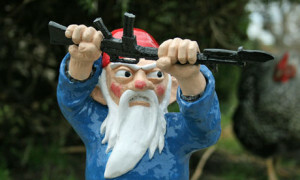 Qualified applicants for the position of gnome military general should apply via blog post by the end of the week. 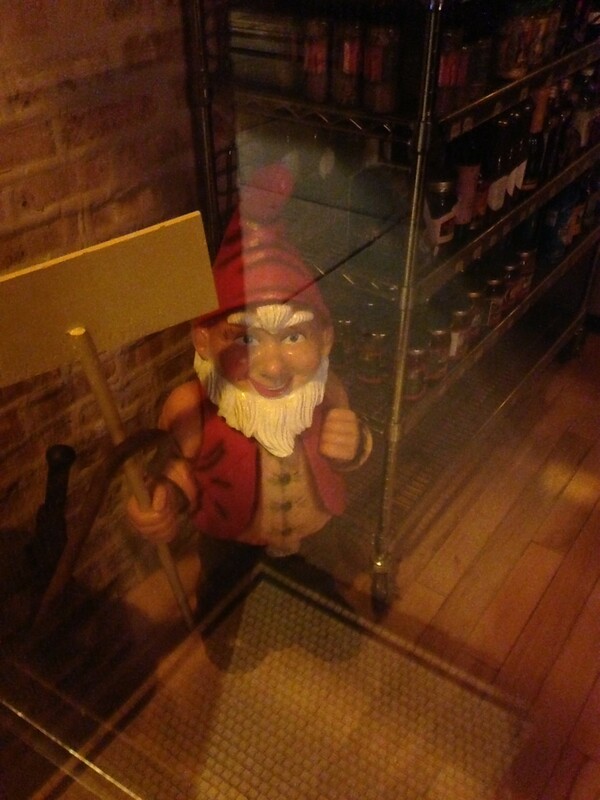 Huge Gnome Sighting at A&L Grocer! I went drunk bowling other night. Yes, of course gnomes bowl. Don’t be silly. I actually have my own shoes (because alleys tend to only carry human sizes) and I’m saving up for my own ball. Bowling balls are expensive. Lately, I’ve been using a nectarine. But be honest. We all really know that bowling is about the cheap beer. Don’t worry, I’ll tell you more about my bowling career soon. I’m getting better and I even bowled a 18 my last frame….double digits, baby!!! After wowing everyone’s socks off with that 18, I decided to end on a good note and head home. I was staggering a bit, but nearly to my bus stop when I caught of a glimpse of something huge…and magnificent. A huge gnome in a grocery store! This sucka was nearly 3-foot tall (if my drunken measurement estimations are anywhere near accurate) and he was holding a sign that was turned away. 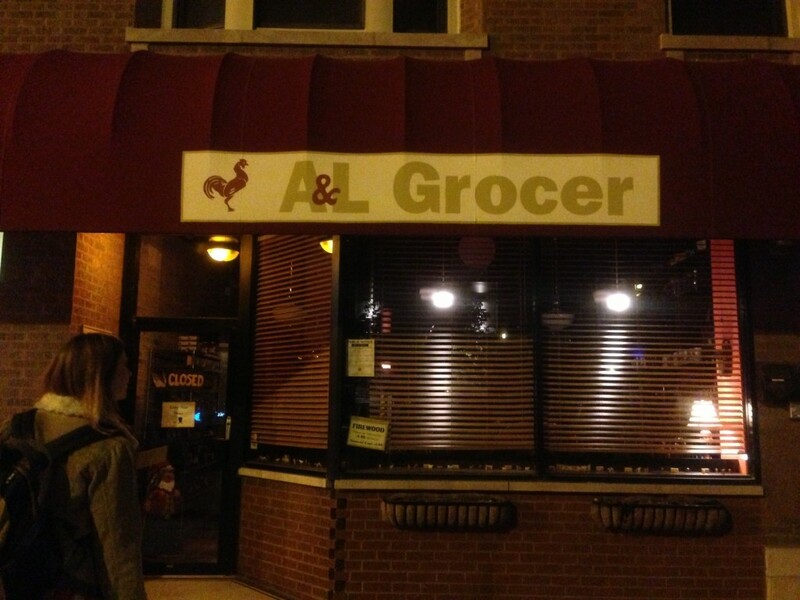 The tiny store was called A&L Grocer and for those of you in the Chicago area, it’s located on Addison between Hamilton and Leavitt. See look, they even get 3.5 stars on Yelp! But momma was wrong, because this gnome sighting did! The whole point is that gnomes this big are very rare to find. Where did he come from? What’s his name? And how did he get hooked up with a grocery store gig? Memorial Day Cheers from the Drunk Gnomes! Three-day weekends mean even more booze-induced incoherence than usual for us drunk gnomes. So we’ll make this short and sweet to avoid any embarrassing misspellings or heart-felt revelations. Memorial Day may be a human holiday, but we jump on board those when there’s a miscellaneous day off of work involved. King Jerry made mention that Memorial Day is supposed to be about soldiers fighting in wars and stuff. But try as I might, I haven’t found a soldier or a war all day! All I can seem to find are barbecues, cold beers, and outdoor shenanigans. Planting some flowers (to ensure we have something to pee behind later). While we don’t expect to remember too many memories of the day, we hope all you gnome and human celebrators make the most of yours. Wave a freaking flag or something! 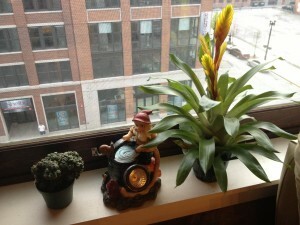 Gnomes: Descendants of Ancient Phallic Fertility Gods? Literate gnomes around the world! Behold! I have come across a text that documents the distant history of gnomes…far more distant than any text has before! 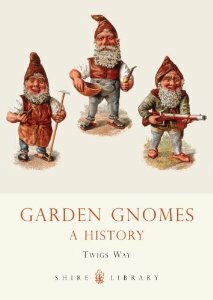 Cue Garden Gnomes: A History by Dr. Twigs Way. Yes, a doctor…a real, life doctor. No offense, Dr. A Chu. Sir Way tells the tale of Priapus, an ancient phallic fertility god, which popped up all over gardens in ancient Rome. Priapus is known for his absurdly over-sized erection. Ouch ladies, all I have to say is ouch. Ahem. This well-endowed god was mostly worshiped in gardens and statues of him lined the gardens of everyone wishing for a fruitful harvest. Apparently, there’s also a medical condition called priapism, that derives its name from Priapus and alludes to the god’s permanently engorged….well, you know. This discovery poses a whole bunch of questions for us gnomes. Do we have special god-like abilities we’ve never known about? Should we be speaking Italian right now? For even more historic discoveries, check out Dr. Way’s BBC article. I started reading it, but then just couldn’t get past the whole phallic god thing without further investigation. Ya learn something every day…. If you’re following gnome news these days, you’re undoubtedly inundated with updates about that Chelsea Flower Show going on over in England. So in case you’re living in a gnome-free cave, here’s what you’ve been missing out on. In no particular order, here’s what’s been going down at Chelsea. Urban Street gnomes emerge from the shadows of darkness. What the hell IS this thing?! I mean it’s kinda rad and all, but don’t call it a gnome. “This unique Street Gnome has a surreal ‘face’ made up of a montage of pop-art designs, with a bird skull at the centre being attacked by two black crows.” Puh-leese. 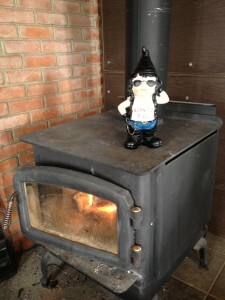 This thing kinda looks like a bad girl I’d like to take out on a hot date, but not a gnome….clearly not a gnome. 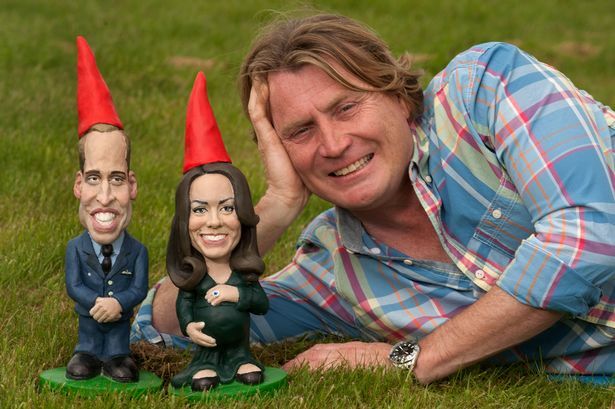 Prince William and Kate Middleton have turned into gnomes! The British fancy pants appear to be bobble heads wearing red, pointy hats. But you know what? We’ll take it! Any depiction of royalty in the forms of gnomes is A-OK with us. I wonder if she’ll pop out a little gnome baby with a pointy, red hat too. The auction money is supposed to also go towards teaching school kids how to garden. We can only hope that more gardeners means more gnomes in the future for England and throughout the world. We’re sort of bummed because we don’t get the BBC Two channel. Does anywhere out there reading this get it? It seems that on Friday 5/24 at 20:00, there will be an episode about the lifted ban on garden gnomes at the flower show and a history of the first gnomes to start a colony in the UK. We’d love to host a viewing party, so if anyone can hack into the BBC and stream it live for us, we’d be forever indebted.